Seagate GoFlex TV HD Media Player is a re-branded Seagate FreeAgent Theater+ HD Media Player that is specifically designed for GoFlex Storage System for that the drive, such as Seagate FreeAgent GoFlex external hard disk drive, can be seamlessly and nicely attached and fitted into the media player. Seagate FreeAgent GoFlex TV HD Media Player allows users to watch, listen and enjoy all kind of movies, music and photos on TV instead of computer, in full 1080p HD with surround sound system. With more content that available downloadable via Internet, the media player is now an essential part of home theater system, doing what previously done by DVD player or even Blu-Ray player. The difference is that instead of inserting disc media into player’s slot, user now copying the media files from computer to a hard disk drive or flash drive, which can then be connected to the media player for playback. Seagate FreeAgent GoFlex TV HD media player is black in color, and is very small in size when comparing with typical DVD and Blu-Ray player or writer, with a dimension of 4.30in L x 5.91in W x 1.65in H (110mm x 150mm x 42mm) and weight of just 0.67lb (0.30kg), just slightly heavier than a portable external hard disk drive. It looks smaller than its sibling, FreeAgent Theater HD media player which means for non-GoFlex FreeAgent portable drive. Seagate FreeAgent GoFlex TV HD Media Player has no control buttons on the device, so all operation will need to be performed via the remote control, which works via infrared (IR). The remote has to be pointed directly to the infrared port on the front of the FreeAgent GoFlex TV HD media player for it to receive the signal, a small inconvenient for people who wants to hide the box from open view or store the player inside a closet. 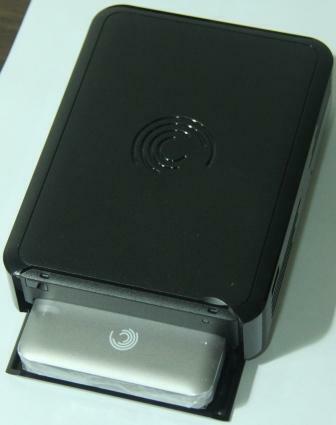 The front of the media player has an opening slot which allows a Seagate FreeAgent GoFlex ultra-portable hard disk drive to be inserted. However, the external hard disk drive can be inserted till about three quarter deep, leaving around one quarter of hard disk drive visible from outside. It also means that the door cannot be closed and must stay opens when the external hard disk is inserted. 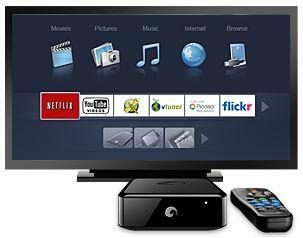 Access, view and play digital media files on home entertainment system. Play content on TV directly from GoFlex ultra-portable drive, or accesses content from digital camera, flash drive or other external drives (either Windows or Mac) through the additional USB ports. Hooks up to TV in seconds via a digital HDMI cable. Connects to PC or Mac computer, NAS, media sharing device or media server on home network, and the Internet via Ethernet or wirelessly with the optional Wi-Fi Adapter. Watch streaming media directly from the Internet, computer and USB devices. Displays all the content that’s included with DVDs, including menus, commentator tracks and subtitles. Include remote control with intuitive on-screen menus for easy navigation. Creates exciting slideshows with own music track for enjoying memories with friends and family. Fits seamlessly within entertainment center. 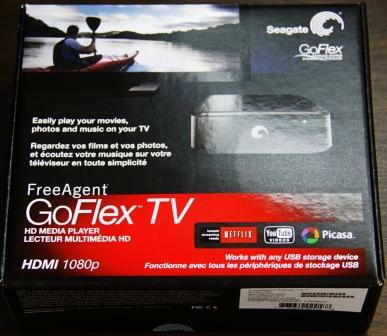 Seagate FreeAgent GoFlex TV model STAJ100 is a media player only package, and thus does not come pre-packaged with a FreeAgent GoFlex drive. However, the media player can accept virtually any external hard-disk based storage media or flash-memory based storage space on its USB port, although the front-slot is suitable for FreeAgent GoFlex ultra-portable drive only. One major letdown is that no HDMI cable is included. 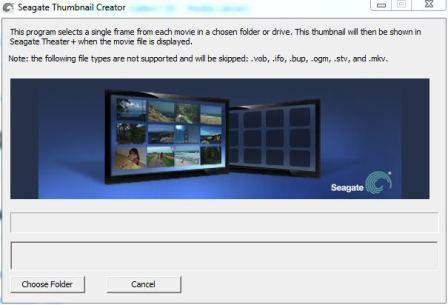 Seagate FreeAgent GoFlex TV media player supports virtually all common video and audio encoding formats currently, as listed below. The codecs supported are comprehensive. There is no problem playing music tracks, audios and videos that been downloaded from BitTorrrent (BT) torrent and eDonkey2000 eD2K network. Switching audio channel for multi-channel audio tracks is flawless. The audio file from iTunes store in AAC, which is DRM-free, is playable too. However, the older FairPlayer-encoded DRM audio files have to be upgraded first. However, I did encounter some subtitles embedded inside the MKV videos are not supported and cannot be shown. But it’s pretty rare case, and can be easily rectified by downloading the subtitle in supported SRT or SUB format, and name it the same name with the video file. FreeAgent GoFlex TV supports Windows PC (Windows XP, Vista, Windows 7) or Mac OS X formatted hard disk drive, with file system such as NTFS, FAT, FAT32, HFS or HFS+. 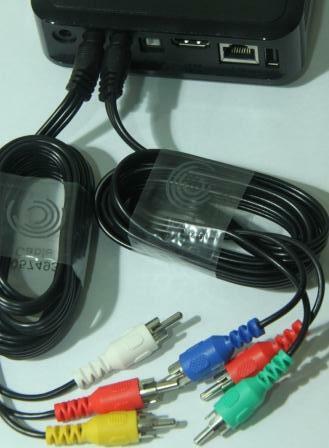 However, one thing to take note of is that as the media player has a much smaller form factor, the composite and component ports on the media player has been simplified to just one special jack, instead of three separate RCA jacks YPbPr for component video or RGB for composite video and stereo audio. It also means that the typical component and composite cables with three connectors on each side cannot be used, and user must rely on the cables provided by Seagate, which most likely cannot be reused on other equipments. Setting up FreeAgent GoFlex TV is easy. 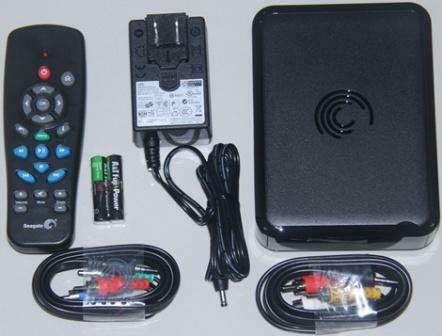 Connect the box to the TV component video or HDMI cable (for HD-resolution video of 720p, 1080i or 1080p) or composite video cable for SD-resolution video (and audio cable if necessary), then connect the power supply, and plug-in a USB removable mass storage space with content on it, and the set is ready to playback the media content on the TV. Once startup, user will be presented with a graphical user interface screen with options for Movies, Pictures, Music, Internet and Devices. The options are straight forward, where clicking on Movies, Pictures and Music will playback video files, images and photos or MP3 and audio files stored on the connected USB drive respectively. One of the neat feature is that FreeAgent GoFlex media player able to scan and detect media files which stored inside sub-directories or sub-folders recursively, and presenting a list of movies available to user in thumbnails view (provided DVD cover or screenshot images are available), making selection easy. The media player can also playback content stored inside a ISO image. One major letdown is Internet capability of Seagate FreeAgent GoFlex TV HD. Internet option allows user to access web services such as NetFlix, YouTube, Picasa, Paramount, vTuner, MediaFly, Flickr, video feeds (RSS), text feeds (RSS), finance widget and weather widget. Unfortunately, it’s not full-fledged web browser though, and user cannot visit websites other than the few built-in Internet services. The built-in apps also does not offer much personalized or customizable options, which making using the Internet modules boring and less attracting. So far, there don’t seem to be an option to add widget or app into Internet module, other than provided by Seagate through firmware update. Navigating via the remote control is not easy too. Through Devices option, user can manually navigate the folders inside the connected USB drives. Useful if there is any media files not been detected and shown by the FreeAgent GoFlex TV. It’s also the place where user connects to a media streamer or streaming service (provided by device such as Seagate FreeAgent GoFlex Net Media Sharing Device), or browse the networked locations, based on Windows File Sharing (WFS) protocol. On the remote control there are also DVD-like playback buttons such as fast forward, rewind backward (which move video at an increment of 1.5x, 2x, 4x, 8x, 16x and 32x), step forward or backward (roughly a 5 minutes jump) and slow motion option. Calling Menu button reveals a bar on top of the screen which makes switching to other functions easier (without having to go back to Home screen), allow changing of subtitle or audio (in movie mode), and allow access to the device’s configuration via Settings. Seagate FreeAgent GoFlex TV HD media player offers 10/100 mbps Ethernet port out of the box for wired connection to LAN and Internet. In addition, an optional Seagate Wi-Fi Adapter USB 802.11n dongle is available for $59.99, and can provide wireless access to the LAN and Internet. Setting up a network connection is automatic on DHCP environment. For secure wireless connection protected by WEP, WPA or WPA2, user need to enter the security key through device’s Settings menu, of course, by using remote control with on-screen keyboard. To access and stream music and video files over network, the folders must be shared through Windows File Sharing protocol (WFS or Samba), or user can use a media streamer, which detectable over uPnP, and network attached storage (NAS) devices. FreeAgent GoFlex TV supports logging into the password-protected shared folders, and will automatically prompt for credentials when required. No special software is required on the FreeAgent GoFlex TV or the computer. For a fast network (connected via wired LAN cable), a HD video files can be streamed directly over the networked drive. The ability to grab files over network allows user to playback media stored on a computer directly without having to copy the files over to the external USB drives connected to media player. However, on a wireless network, the speed is slow for a HD video files, in particular 1080p video, even on a wireless-N network. The quality of the video and audio is highly dependent on the quality of the media been played, and may also affected by the hardware – type of TV and speaker or home theater been used. When playing back high quality HD media, FreeAgent GoFlex HD is able to recreate superb rendering of HD video on HDTV. If you’re still using a CRT, there won’t be much different though. Audio wise, digital audio requires HDMI or optical digital output, which recreate Dolby Digital and DTS surround sound effect perfectly on a home theater setting. I particularly like the responsiveness of the FreeAgent GoFlex TV HD media player, when navigating its menu or when controlling the playback of movies, videos, musics or photos. I was annoyed by the fact that video and audio will stop playing when pressing the Menu button on the remote control during playback. For you info, you have to go into Menu in order to enable subtitles or change audio channel. So far, I couldn’t find a way to force the media player to always display subtitle when available or play the preferred language channel. There is not much noise from the media player. No noisy sound of spinning fan, though the device gets pretty hot when powering on for extended period of time. One thing to note is that on initial startup, the FreeAgent GoFlex TV is outputting video at lowest resolution of NTSC 480i. User can press the Menu button on the remote control to go to the Settings to change the video output resolution. FreeAgent GoFlex TV HD media player includes a CD-ROM with a Media Sync and Video Thumbnail Creator program, which is again, two less than useful software, which can be conveniently ignored. Media Sync is the FreeAgent Theater application that allows users to automatically synchronize media files between computer and a FreeAgent GoFlex ultra-portable drive or any NTFS, FAT32, HFS/HFS+-formatted USB external storage device. The application is available for both Windows and Mac platform. Media Sync recognizes media files in supported formats on computer and automatically sorts them into movie, picture, and movie folders on the connected drive. In addition, Media Sync’s Automatic Sync feature (via Custom Sync) continuously tracks changes in media folders and files, and automatically updates drive whenever it’s connected to computer. 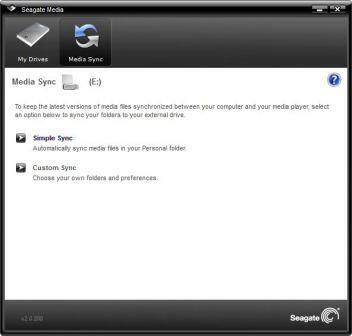 The Media Sync is not necessary a must install, as user can always transfer files from computer to the external hard disk drive by simple copying. The media player can be used and can playback all media files which is copied over but not synced by Media Sync. Video Thumbnail Creator, as its name implied, is a software that allows user to generate thumbnail image for the video files by selecting one frame from the video, so that the thumbnail will be displayed by the media player. If you prefer to use cover disc image as the thumbnail, the program won’t help much. Furthermore, it also does not support some popular video formats such as .mkv, .vob, .ifo, .bup, .ogm and .stv. Seagate has regularly released firmware update from FreeAgent GoFlex TV, with the factory default version of 1.55, which is already the latest firmware version. When new firmware is available, firmware upgrade can be done online or offline via USB storage medium. Seagate FreeAgent GoFlex TV is a worthy addition to the living room. In fact, who families who seldom purchase physical DVD or Blu-ray disc media but buying contents via digital downloads method will prefer a media player instead, where Seagate FreeAgent GoFlex TV allows media to playback directly in TV without having to burn to DVD or Blu-Ray disc first. As a media player, Seagate FreeAgent GoFlex TV is definitely one of the best and most easy to use media player in the market today. One major winning feature of Seagate FreeAgent GoFlex TV is broad audio and video support, in addition to Netflix support, allowing direct streaming of online movie rentals to TV. Now the problem is that Seagate offers both Seagate FreeAgent GoFlex TV and Seagate FreeAgent Theater+ HD media player. For people with a FreeAgent GoFlex ultra-portable external hard disk drive, getting a FreeAgent GoFlex TV is no-brainer. So do people with FreeAgent Go portable hard disk drive should go for FreeAgent Theater+, as each media player is designed to fit seamlessly with the HD media player in own series. For people who looking for a media player, Seagate FreeAgent GoFlex TV is well worth getting, been one of the most versatile media player that works silently, reliably, perfectly, and relatively fast. With the ability to attach an wireless adapter, the Seagate FreeAgent Go Flex TV HD media player can go wire-free too. The device has two (2) USB ports which allows other brand of mass storage device to be plugged in. Available at $108.83 (aff) through Amazon (official price is $129.99 without hard disk), the Seagate media player is around the same price with competitor’s product, and in some cases, cheaper. However, it’s slightly more pricey that Seagate FreeAgent Theater+ HD media player. Disclaimer: My Digital Life receives a Seagate FreeAgent GoFlex TV for reviewing.